When I lived in West Texas, I would classify my skin as “dry” –likely because all of West Texas would be classified as dry. Since moving, I’ve noticed my skin is more distinctly “combination” –partially dry, partially oily, partially okay. (Really, this just means it sort of does what it wants now and I get to play along day-to-day.) I had to adapt my routine with the major climate and lifestyle changes my skin did not enjoy going through (more on that story, this post). 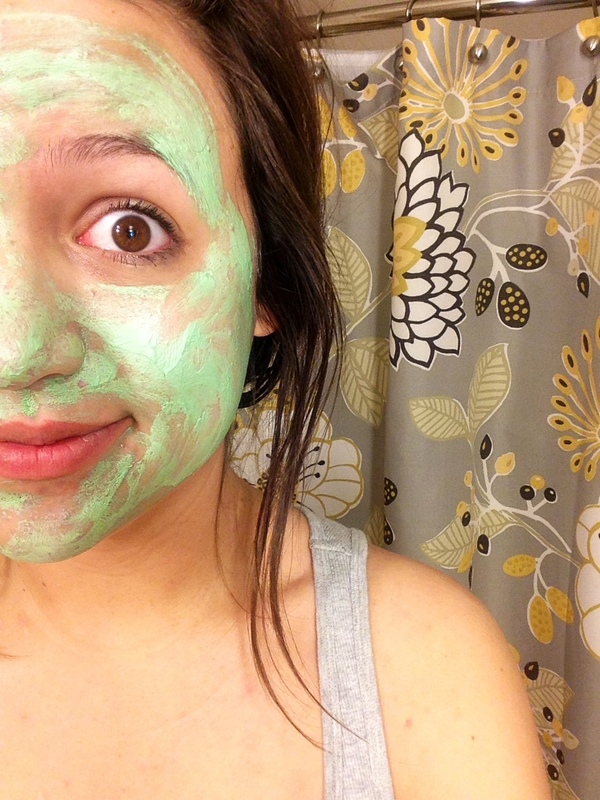 In the process, I found this little miracle-worker face mask. For about a month and a half, I’ve harnessed my inner Witch of the West every 4-5 days with this mask, and I love it. While applied it feels slightly tingly, which I like because in my mind it feels like the product working. The only way to adequately describe the post-mask sensation is that I imagine it’s what my face would feel like if I brushed it all over with minty toothpaste –very fresh and clean. Just for you Daily Sprinkles readers so feel honored -because that’s a little embarrassing (but it’s only half a selfie, that’s not so bad, right?) I wanted to show you about how much I apply, that this is really about all the product you need for the magic to start working. There’s no need to cake on a super thick layer like some masks, part of what I like about it. You get a lot of masks out of just one jar. If you aren’t ready to totally commit to the full $16 jar, they do offer little single sample sizes for a fraction of the full size here. There’s actually a whole line of Tea Tree Oil products I’m interested in eventually giving a shot. I also won’t pretend my face is on a magic -beauty-fairy-grade level of perfect now, but there have been notable improvements. Do you have some go-to face masks or skin care brands? I’d love to hear about them and possibly check them out myself, comment below! This was the first time I’d used anything from The Body Shop other than body butters, but I’m definitely going to check your blog out! That product sounds great! I definitely recommend this whole line from The Body Shop. I use the little jar of just tea tree oil to spot treat in the morning and at night and it has seriously saved my skin. I had horrible acne all through high school and then most of college and finding how amazing tea tree oil was a life changer! That’s great to hear! I’m probably giving it a shot soon. Thanks for the feeback!